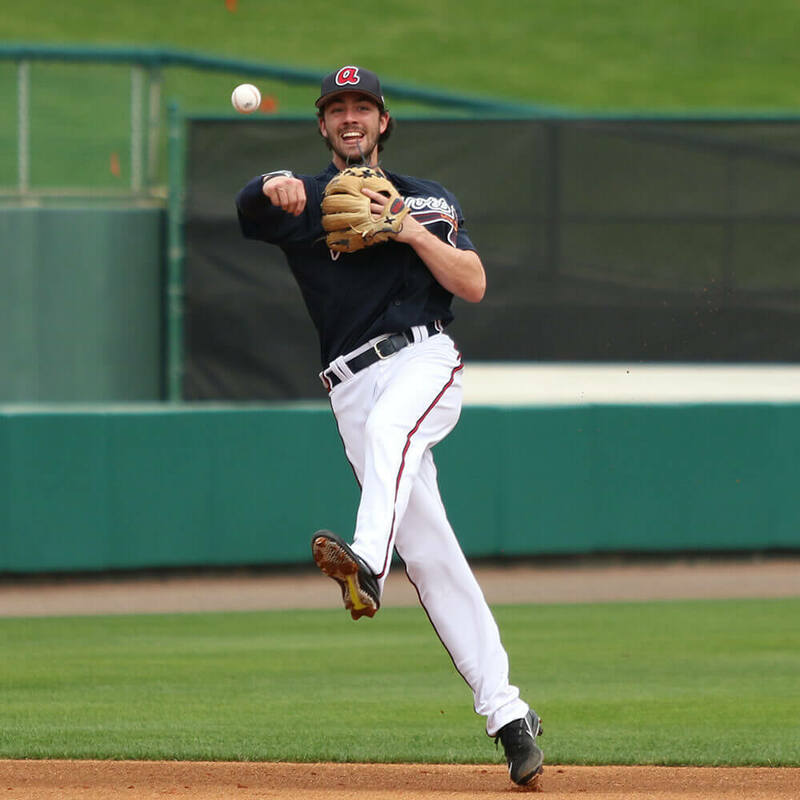 As we like to do (a lot admittedly), we did a one-month check-in on a couple of guys we’ve had the pleasure of speaking to before: the new Atlanta Braves middle infield, former #1 prospect Dansby Swanson and 4-time Gold Glover Brandon Phillips. These are two MLB’ers that know a thing or two about swag, whether it’s their glove, their cleats, or just the way they play the game. They keep it fresh year in and year out, so it surprised us when they took the field with their gamers from last season. 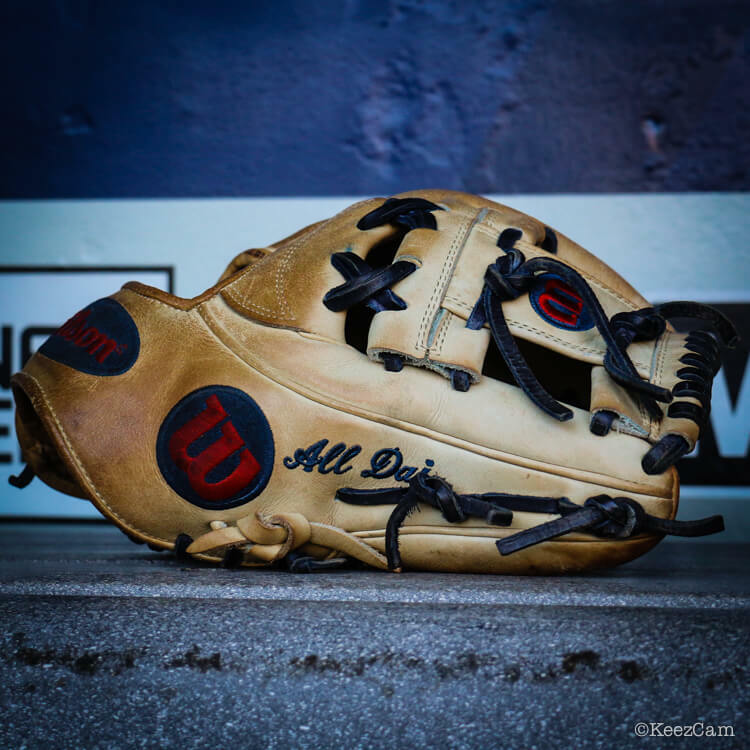 What He is Wearing Now: The gorgeous Wilson A2K 1787, an 11.75” model with an I-web that he designed in Spring Training, used in the MLB and MiLB regular season, and had used this Spring Training and now the 2017 regular season (buy now). The clean blonde look is gone, but that does not mean his glove still does not maintain its beauty – we still consider this dirt-covered, pine tar-coated glove in its prime despite heavy use. Put simply, he likes the extra flexibility of the A2000 vs. the A2K, as Pro Issue A2K’s are notoriously stiff and tend to have a stiff pocket and heel, both of which Swanson addresses in the video. It should also be noted that Swanson used an A2000 in his Vandy days. You can read a great article we put together about A2K vs A2000, which includes input from Big Leaguers like Daniel Norris and Tony Kemp. Will He Use the Glove We Expected Him to Use? 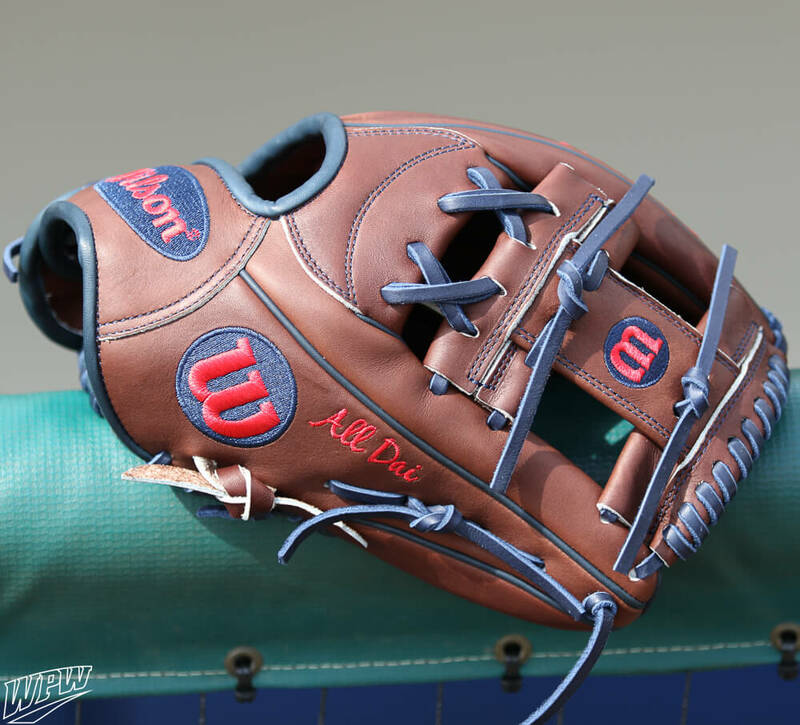 We believe it is a 50-50 chance because Swanson loves that A2K model, and even though it looks used, A2K’s are not the type of gloves to break down fast – even if it faces everyday use from 90+ mph throws. There is one certainty, though. Either of the gloves Swanson ends up using looks amazing. 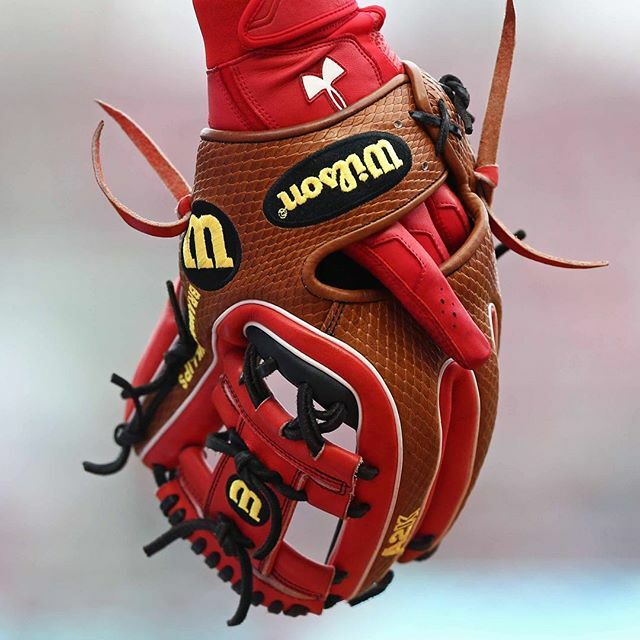 What He is Wearing Now: Like we noted earlier, his 2017 game glove is the glove he gamed last year, a red, black, white, and saddle tan Snake skin model in his own 11.5” pattern, the DATDUDE. 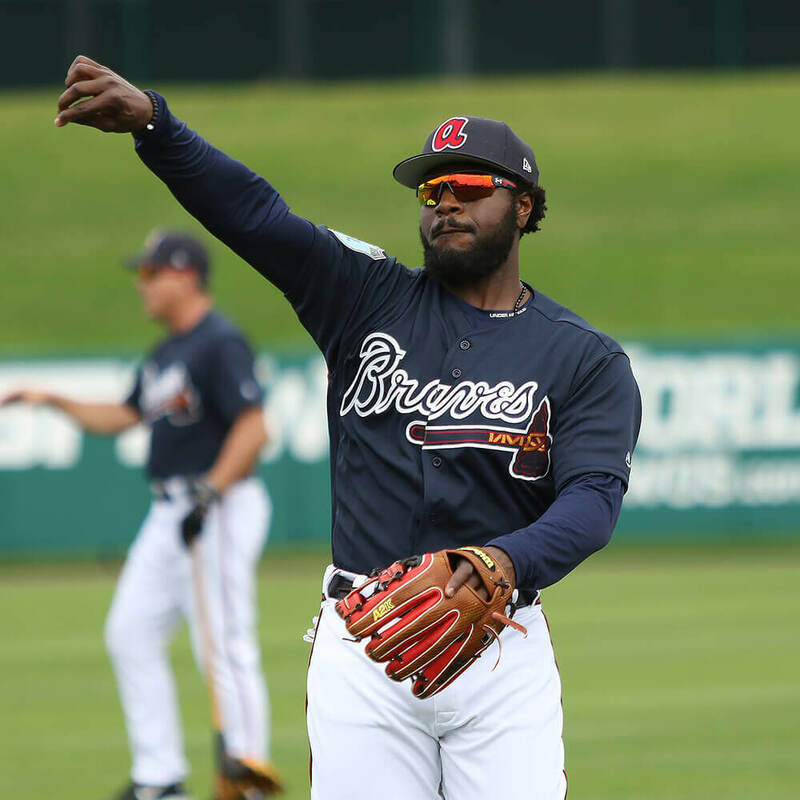 There is just one problem with this glove – it matches his former team, the Reds, much better than it matches his current team, the Braves. What We Expected Him to Wear: We were not completely sure what he would be taking out to the field this year with the sudden trade to Atlanta. It’s colorful, with navy, the main color of the Braves, blonde, a color Phillips likes to use, and red, a secondary color of the Braves. 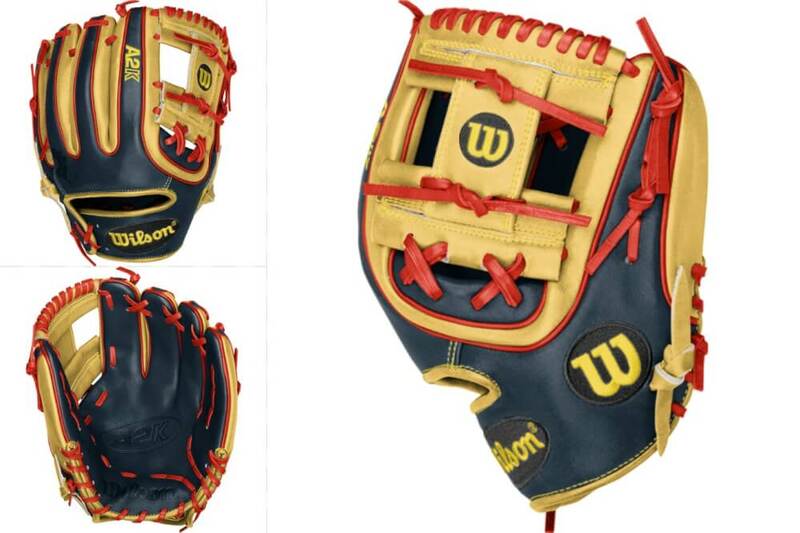 Of course, do not forget one thing Phillips has to have on his glove: Wilson yellow/black logos. You can shop it here.